What do you think true love looks like? What comes to mind? Is it a Hollywood movie like The Notebook or Titanic? Maybe it’s your favorite couple from TV, such as Ross and Rachel from Friends, or real life celebrities like Tom Hanks and Rita Wilson. Or maybe your vision of the nature of true love is something closer to home, like the images in your mind of the kind of relationship your grandparents shared over many years? Without a doubt, the term “true love” can mean a lot of different things to a lot of different people. Also, while a lot of romantic movies, TV shows, and pop songs focus on the thrill of love at first sight and the beginnings of a relationship, content and functional long-term relationships aren’t depicted as frequently. While grand gestures are often appreciated, the most important part of fostering a romantic, loving, and long-lasting relationship is ensuring that smaller, daily interactions with each other are thoughtful and respectful. 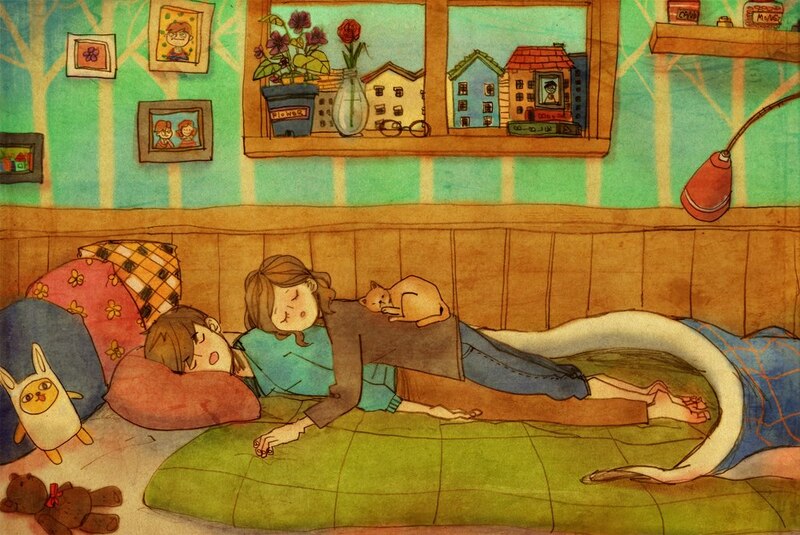 Artist Puung shows how important these kinds of small interactions are in these beautiful and heart-warming illustrations of romantic love. Each picture captures the daily and often mundane rituals of love that everyone can relate to. Through these simple images of everyday life, Puung is able to portray how meaningful the personal moments you share with your partner actually are. These amazing illustrations help to remind us that love is always beautiful, and touching moments of generosity and thoughtfulness can often be overlooked due to the humdrum nature of daily life. If this series of illustrations captures your heart, you can view more of Puung’s work here. So, which image below best describes your understanding of true love? What did you think of Puuung’s art? Do you relate to these depictions of the way in which romantic couples make a life together? Comment with your ideas and experiences below!